Found these gorgeous Easter Eggs linked from yahoo article. 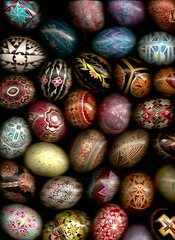 They are done in the Pysanky style of painting eggs. Beautiful eggs for an exquisite day of hope and faith. Glad you liked them. All of these eggs are a few years old, and I only made a few this year so I’m glad that you enjoyed the photo since I felt guilty about not making more. « Back to the Future?